There are only a few days left to snag the best email client available on Windows for 50% off. If you live in the northern hemisphere, then spring is here. That means scrubbing, mopping, brushing, and generally cleaning after winter to prepare for the year. But, when was the last time you cleaned out your email client? We want to ensure you have the best tool to give your digital life a spring cleaning, as well. 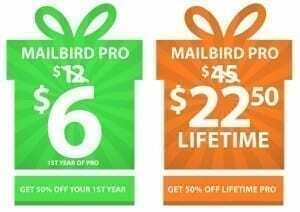 That’s why, for another few days, you can get Mailbird Pro lifetime or yearly for 50% off. Get the best tool to clean out that dirty spam folder, organize your email accounts – get the best email client on Windows.